Original and one of a kind. 11"x17" signed cover art work for. Marvel Comics Hulk #1 (2017). Exclusive Variant by Ed McGuinness. 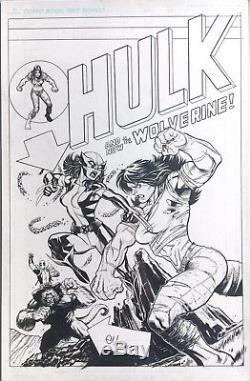 This is the original art by Ed McGuinness for the cover of The Hall of Comics' exclusive shop variant for Hulk #1 (2017). 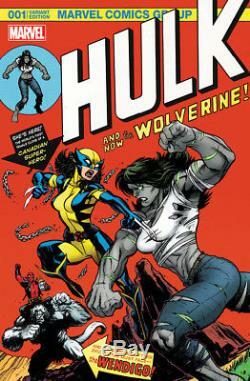 The image is an homage to Hulk #181 (1st appearance of Wolverine) and features X23 fighting She-Hulk with Deadpool in the background. It was created exclusively for the "Popcorn Variant" edition of the cover. The variant was produced and offered exclusively by The Hall of Comics & More Great Art. This piece of art is 11"x17" and is signed by the artist. E've also included an image of the published comic book cover merely as reference. The photo featured in this listing is an actual scanned image of the original art work being offered. The item "ED McGUINNESS original cover art for HULK #1 variant homage to Hulk #181 X23" is in sale since Friday, November 03, 2017. This item is in the category "Collectibles\Comics\Original Comic Art\Covers". The seller is "therealhallofcomics" and is located in Southborough, Massachusetts.